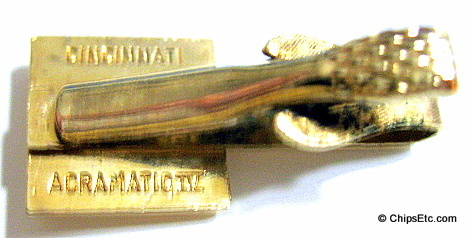 Specialty: CNC machine systems, First Numeric Controlled computer system for machine tooling to use Integrated Electronic Circuits - The Acramatic IV. Industrial tool systems, injection molding machines. 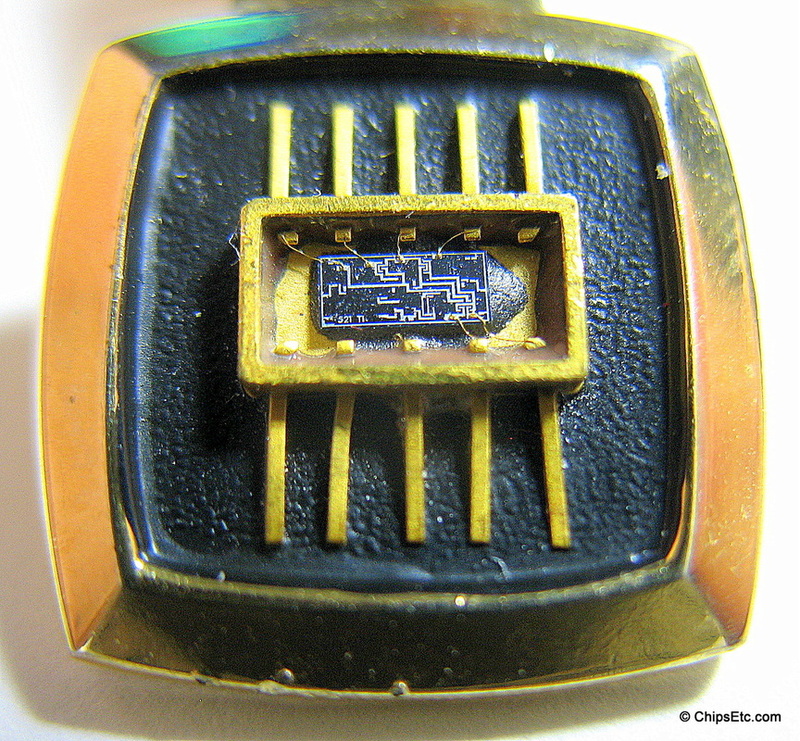 In 1965, Cincinnati Milacron's Controls Division (CIMTROL) introduced the "Acramatic IV", the first numeric machine process controller in the industry to use Integrated Circuit Electronics. A computerized numeric controller (CNC) is a device that processes the multi-axis movements of a machine's tool feed. 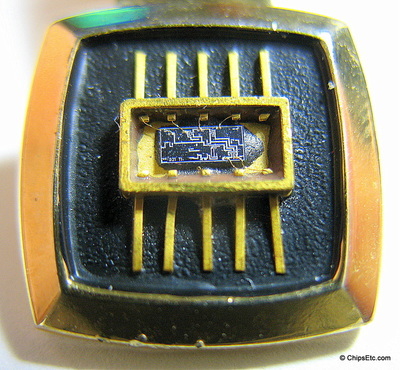 One Integrated Circuit logic card in the Acramatic IV numeric controller replaced as many as ten circuit boards in earlier machine process controllers. 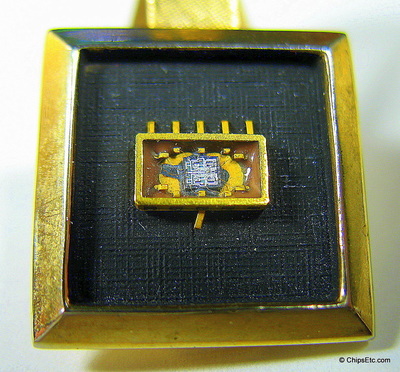 Using high-speed lC's the new Acramatic IV was 100 times faster than the fastest comparable systems of the time, with cycle times reduce to just 0.00035 seconds. 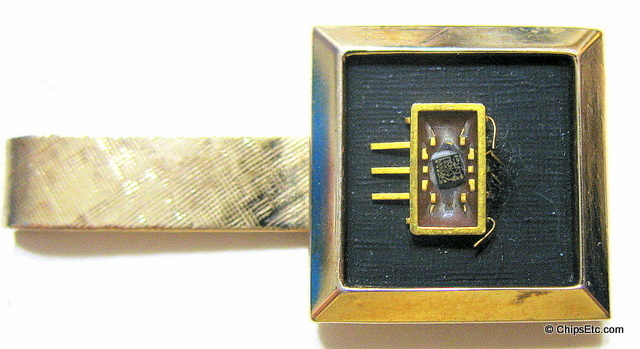 Besides being much faster, Integrated Circuits also made the Acramatic IV system smaller & more reliable than previous systems. 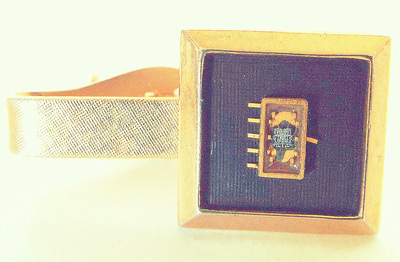 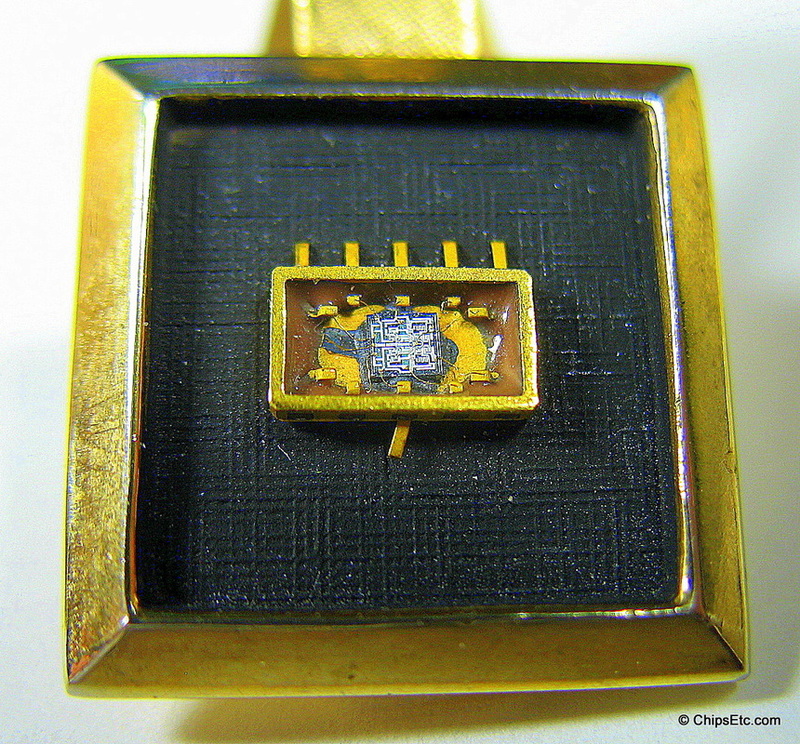 This Tie clip promoting the Acramatic IV features an Integrated Circuit chip set in a 10-lead gold surface-mount package. 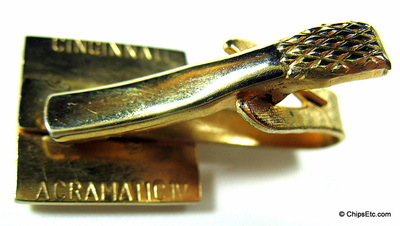 ​Back of tie clip is marked "Cincinnati Acramatic IV". 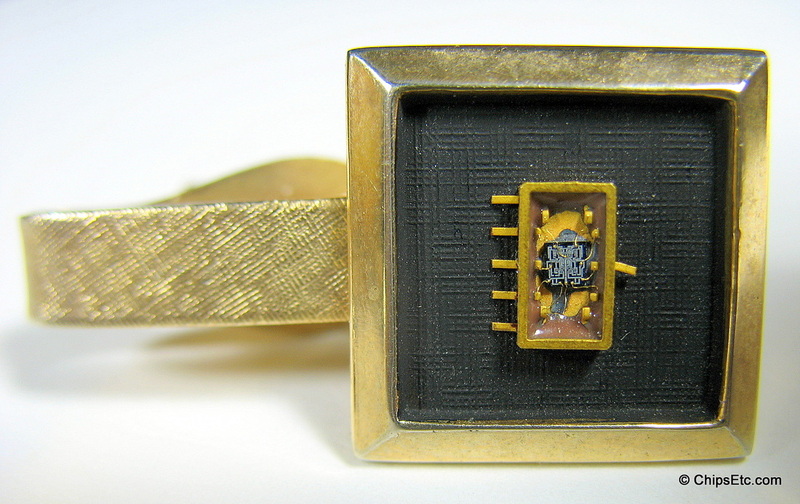 Another Tie clip promoting the Cincinnati Acramatic IV CNC featuring an Integrated Circuit chip set in a gold 10-lead flat pack. 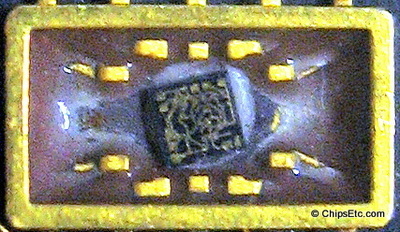 This IC chip is a Texas Instruments "SN521" operational amplifier (Op Amp) from the SN52x series of linear integrated chips. 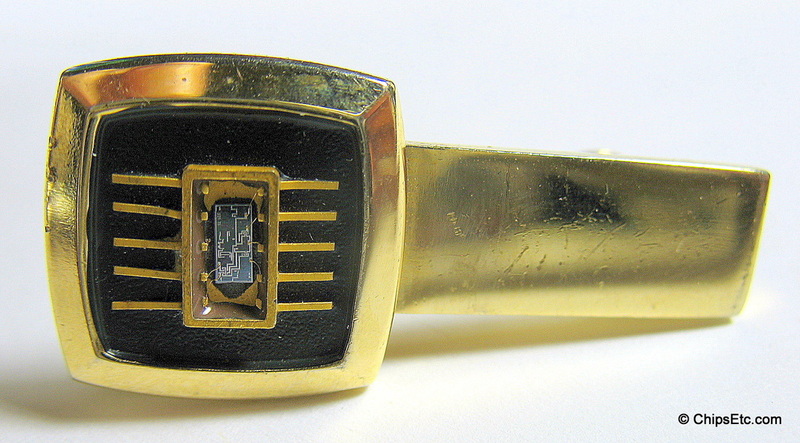 Back of tie clip is marked Stratton England. Another Tie clip from Cincinnati Milacron featuring a different Integrated Circuit chip set in a 10-lead gold surface-mount package. Back of tie clip is marked "Cincinnati Acramatic IV".